Även om den här artikeln har något år på nacken så illustrear den hur "media" med alla medel försöker tysta ner det som sker, många artiklar i frågan har pekat åt ett annat håll sedan dess vilket bevisar att några hundar ligger begravda här......frågan är vilka som avlönar dem..? Vita linjer i skyn har blivit en allt vanligare syn under de senaste­ hundra åren. Oftast tar vi inte någon särskild notis om dem, lika lite som vi brukar lägga märke till de vanliga trista molnen. En och annan naturfotograf kanske irriterar sig över att ett vitt streck på himlen förstör en vacker landskapsbild. Andra kanske tycker att de är vackra, som picassoteckningar i skyn. Men hur uppkommer dessa streck och hur påverkar de vår miljö och vårt klimat? Scientists have been looking for ways of modifying the Earth's environment to control global warming - it's known as geo-engineering. One way to do this is simply to reflect more of the sun's light, changing the Earth's reflectivity, or albedo. This could be attempted using vast, flexible space reflectors (1) placed in orbit around the Earth. Alternatively, various types of "stratospheric aerosols" could be released in the upper atmosphere (2) to scatter some light back out into space. Earth-bound reflectors (3) could do the same. Another approach is to directly reduce the atmospheric carbon that, among other things, leads to temperature rises. This could be done by "fertilising" the ocean , stimulating the uptake of carbon by surface algae that would eventually sink to the ocean floor. Exposing the surfaces of carbonate and silicate rocks in "enhanced weathering" could provide a place for carbon to be absorbed. Another frequently mentioned proposal is the capture of carbon dioxide from the air using "artificial trees", followed by liquefaction and storage, probably in underground reservoirs. There is no single geo-engineering "silver bullet" that should be pursued as an all-encompassing solution to climate change, says the UK's Royal Society in its analysis of the cost of a range of proposals compared with their efficacy. Stratospheric aerosols seem to offer the most effect for the least investment, and could be deployed soon, but present an unknown risk to the environment. Changes to desert surface albedo are projected to be more effective than ocean fertilisation, but both could change delicate ecosystems in unexpected ways. A lecture that goes into detail about chemtrails and how they affect us and our world and why. John Holdren , Obama’s Science Adviser believes that geo-engineering will assist the planet is stabilizing its weather with regard to global warming.
. Indeed, warfare now includes the technological ability to induce, enhance or direct cyclonic events, earthquakes, draught and flooding, including the use of polymerised aerosol viral agents and radioactive particulates carried through global weather systems. Various themes in public debate, including global warming, have unfortunately been subsumed into much larger military and commercial objectives that have nothing to do with broad public environmental concerns. "Now I am become death, the destroyer of worlds." These were the words that went through J. Robert Oppenheimer's mind as he watched the test of the world's first atomic bomb in 1945. "We knew the world would not be the same," he later remarked. In a tumult towards the end of the Second World War, American scientists developed the atomic bomb in what was known as the Manhattan Project. A few weeks after the test, it was dropped on Hiroshima and Nagasaki with well-known devastating effect. Hundreds of thousands of Japanese civilians were killed and the war skidded to a halt. A similar tumultuous rush is currently on to develop solutions to global warming. As described in ABC Environment's feature today, ideas such as injecting sulphur into the upper atmosphere and putting mirrors in space are now being considered as real ideas with merit, rather than dismissed out of hand. If ever there was any doubt about how seriously climate science is taken, look to the regard such crazy-sounding schemes are being given in humanity's quest for solutions to the problem. As science journalist Eli Kintisch recounts in his brand-new book Hack the Planet, "Since [a 2007 meeting in Harvard], almost every forum relevant to the climate crisis has reached out to embrace, if tentatively, the former pariah called geoengineering." He lists the Royal Society, the US National Academies, the Pentagon, the American Meteorological Society, and the US Department of Energy as examples of organisations that have looked into the idea of tinkering with our climate systems to undo the damage that has already been done. Bill Gates is so enamoured of the idea that he devotes US$1.5 million of his vast fortune to research in the area every year. "Two years ago it was possible to read the relevant literature in the field on a train from Boston to Washington. Now, publications proposing analysing various means of large-scale intervention appear every few weeks," Kintisch writes. It is a sentiment echoed by Sam Doust, the creative director and co-producer of the ABC's new project, Bluebird AR. Part online game, part entertainment, part thought-experiment, Bluebird explores the scenario of geoengineering technology falling into the wrong hands. Doust says that when the idea for Bluebird was dreamed up, geoengineering was a niche scientific discipline, the preserve of kooks and retired engineers. But over the development period, all that changed. "During the initial months of Bluebird AR scoping and pre-production, geoengineering was a fringe subject in the climate change debate and reasonably unknown. In the past 12 months however, geoengineering has become a hot topic and events in the real world have actually played out in uncanny similarity to those in the narrative," says Doust. Geoengineering is increasingly being touted as our insurance policy for if the world fails to arrest our carbon dioxide emissions. As Kintisch says, "To cogently oppose geoengineering research... one has to accept one of two faulty propositions: either the problem is not that serious, or we're on our way to solving it. These days, one will be hard pressed to find many takers for either." While it is distasteful to many scientists, such as David Battisti, a professor of atmospheric sciences who Kinitsch's excellent book follows, many acknowledge that at least doing the research is worthwhile. Just in case. Much like the atomic bomb, it is a morally abhorrent idea that might be worth pursuing as a last resort. Back in the Manhattan Project's bunker, other reports from the test of the atomic bomb relayed that Oppenheimer had looked pleased with the explosion. One of the military men present described Oppenheimer's reaction as: "his face relaxed into an expression of tremendous relief." As a scientist intent on a project, no doubt he was pleased on some level that the invention had gone off as expected. The worst-case scenario project - the Plan Z - was ready to roll. Today's geoengineering researchers are no doubt aware of their ability to become "destroyer of worlds". The question is what kind of calamity is great enough to warrant the deployment of such modern-day Plan Zs. The extreme end of climate change disaster predictions are that sea levels rise by seven metres, whole countries disappear, coral dissolves, seafood disappears and temperatures soar by six or more degrees Celsius triggering drought and famine. Would such a series of events be a sufficient trigger for the untried idea of geoengineering, with its unknown outcomes? Like dropping a bomb, it may or may not win a war. But like dropping the A-bomb it may trigger unforeseen consequences. Just as we had the nuclear arms race, we one day could see a geoengineering technology race: the first to develop weather-changing technology wins. Länk till vattenprov Vara tätort..
A Royal Society study says some types of "geoengineering" to fight climate change -- using space mirrors or stratospheric aerosols -- are "very likely" to work, but there is also a danger of unintended, irreversible effects on the environment. The study, released today, also raises fears that pursuing such techniques might be viewed as a "get out of jail free card" that could undermine the urgency to cut carbon emissions now to fight the problem. The study examined two types of geoengineering: solar radiation management, which would reflect the suns rays away from Earth, and carbon dioxide removal. Among some of the ideas: desert reflectors; widespread use of white roofs; fertilization of oceans to enhance its uptake of CO2; artificial trees and space-based shields or reflectors. One idea -- cloud ships -- envisions an ocean-cruising vehicle that would blow moisture into the atmosphere to create artificial clouds to reflect sunlight away from Earth. Some ideas, however, were rejected as impractical or dangerous, such as pouring iron into the ocean to spur the growth of algae that would soak up more CO2. It was viewed as dangerous to marine life. "None of the geoengineering technologies so far suggested is a magic bullet, and all have risks and uncertainties associated with them," says professor John Shepard, who chaired the year-long study. "It is essential that we strive to cut emissions now, but we must also face the very real possibility that we will fail. If 'Plan B' is to be an option in the future, considerable research and development of the different methods, their environmental impacts and governance issues must be undertaken now." He warns, however, that "used irresponsibly or without regard for possible side effects" geoengineering could have "catastrophic consequences similar to those of climate change itself." This turns out to be very far from the truth. While I concentrate most of this article on just one recent example of professional research on the topic, there have been hundreds of both official and unofficial documents exploring and exposing the military and civil aviation antics responsible for spraying layer upon layer of toxic aerosol “chemtrails” in the sky above our heads on an almost daily basis for the past ten years. These events go unreported by the mainstream media and governments remain silent. This collusion, whether intentional or otherwise, keeps us in the dark with regard to a grand geo-engineering experiment that has the effect of hobbling our health and severely disrupting the natural environment. And we would have been lost but for the internet. The Case Orange report reveals the existence of publicly available material indicating that various forms of geoengineering have been going on for “at least 60 years.” Early examples include the ‘cloud seeding’ UK war operations in Germany during World War Two and the US attempts to dislodge the North Vietnamese during the Vietnam War. However, these pale into insignificance compared with the extensive nature of current activities. 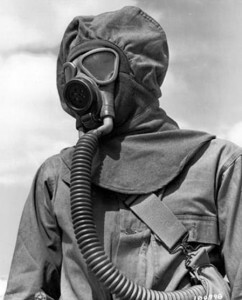 Controversy over the potentially detrimental effects of such activities on both the environment and human health led to ‘Environmental Modification’ (En Mod) weaponry being banned under the auspices of “The UN Convention on the Prohibition of Military or Any Other Hostile Use of Environmental Modification Techniques” in 1987. It is not clear whether this ban was ever fully enforced. However, interest in En Mod soon gained prominence when global warming warnings and accompanying environmental stress issues attracted global scientific interest . 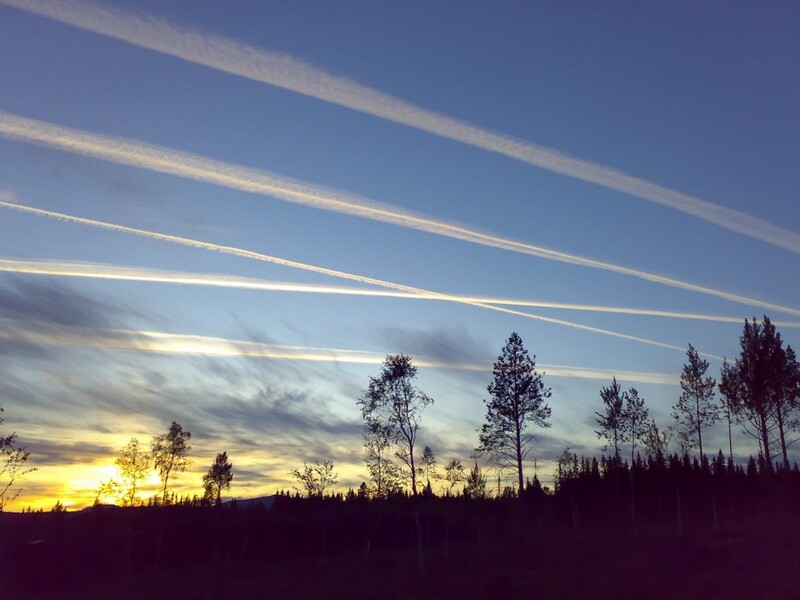 Then in 2009, the publication of a report entitled “Modification of cirrus clouds to reduce global warming” put the case for further geo-engineering strategies . These all had the stated intent of creating a layer of reflective cloud capable of bouncing back the sun’s rays to prevent unwanted terrestrial climate heating. The report states that the findings of The Intergovernmental Panel on Climate Change supports the proposition outlined in the Hughes Aircraft Patent 1991 on stratospheric seeding for reduction of global warming. Hughes was later bought by Raytheon, The US government’s private defence contractor. This is the same company that acquired the contract to build HAARP (The High Frequency Active Auroral Research Program) in Gakona, Alaska. Geoengineering (the name used by the government for chemtrail-related operations) has been a "secret" operation, but because it has been openly visible for years, a significant portion of the public began to notice and to ask questions. The government has attempted to keep chemtrails out of the mind of the public by making most of them non-persistent (short). In Maine, this occurred in April, 2009. The government further attempted to remove chemtrails from public awareness by moving more of them to high-altitudes. Although some non-persistent chemtrails remain at low altitudes, they are fewer in number. In Maine, this change occurred in April, 2010. The government continues its propaganda campaign to normalize chemtrails. This campaign claims that non-persistent chemtrails are "contrails" consisting of only water vapor. They make little attempt to explain the odors and tastes in the air, nor do they attempt to explain skyrocketing aluminum levels in soils. We are living in a monumental time. Corruption, scandals, and disinformation are at an all-time high. 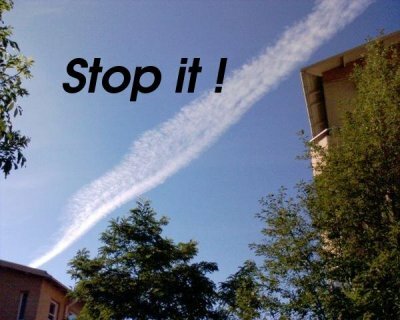 Governments around the world are attempting to grab power and control the public at an unprecedented rate, but of all the evils we are experiencing in this time, nothing is more harmful or deadly than chemtrails (a.k.a. "geoengineering"). When the survivors of this time tell stories about these events to future generations, those people will raise their eyebrows in astonishment asking, "Why on Earth would people ever allow this to happen? What was wrong with them?" The answer that will be given is simple: They were selfish, they were apathetic, or "They were drugged." 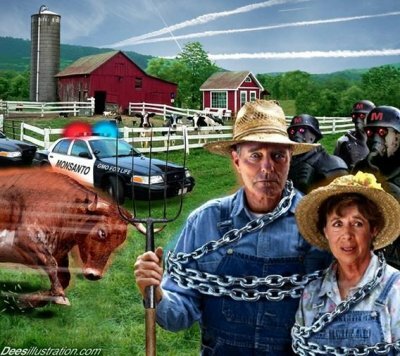 September 29, 2011 Rosalind Peterson is the California President and Co-Founder of the Agriculture Defense Coalition, formed in 2006 to protect agricultural crop production from uncontrolled experimental weather modification programs, atmospheric heating and testing programs, and ocean and atmospheric geo-engineering programs. In 1995, she became a certified U.S.D.A. Farm Service Agency Crop Loss Adjustor working in more than ten counties throughout California. Rosalind earned a BA degree from Sonoma State University in Environmental Studies & Planning (ENSP), with emphasis on agriculture and crop production. Between 1989 and 1993 Rosalind worked as an Agricultural Technologist for the Mendocino County Department of Agriculture. Rosalind has won several awards and recognition for her extensive efforts to protect drinking water supplies from toxic chemical contamination in Martinez, California. In this interview, she will discuss weather modification, geo-engineering programs and the connection to crop loss. Topics Discussed: agriculture, persistent contrails, manmade clouds, crop loss, restrictive sunlight to crops, maps from your congressman Mike Thompson, intra flights, ramjet, cloud seeding, global warming, “Global Geo-engineering Governance”, upper atmosphere experiments, OCEANA, aluminum. Geoengineering Violates Your Human Right to a Healthy Environment; Here’s What YOU Can Do About It! (CLN) Numerous treaties and agreements have documented your human right to a healthy environment. Geoengineering violates your right to a healthy environment in many ways including numerous health, agricultural, and environmental issues. * There has been no decision to go forward with “solar radiation management” and therefore there is no need to test the hardware designed to implement it. * The Convention on Biological Diversity adopted a moratorium on geoengineering activities last year in Nagoya, Japan and this experiment goes against the spirit, if not the letter, of that decision. * There has been no transparency on the part of the researchers involved as shown by their failure to disclose the location, timing or the basic scientific background on the test. * While it may seem innocuous to shoot seawater through a hose, the plan is to be able to deliver an estimated 10 million tonnes of aerosols to the stratosphere – 20 kilometers above Earth. This experiment is only phase one of a much bigger plan that could have devastating consequences including large changes in weather patterns such as deadly droughts. "" "We already know that humans can geoengineer planet earth -- that's why we have climate change," say's Pat Moone "The notion that we can successfully correct our unintentional destructiveness with intentional geoengineering is ludicrous, even the governments who caused the problem to experiment together on geoengineering solutions is criminal! 191 countries recently rejected geo-engineering as environmentally reckless. 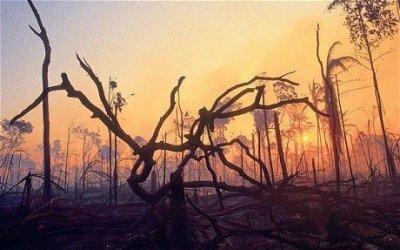 But the Australian Government's "Climate Ready Program" suggested that geo-engineering projects using genetic engineering or nanotechnology may be eligible for federal funding.. Even more concerning is that the federal government is open to funding nanotechnology-enabled 'geo-engineering' projects and applications are invited that "use biotechnology or nanotechnology to address the effects of climate change on humans and the environment..."
"Others are engaging even in an eco-type of terrorism whereby they can alter the climate, set off earthquakes, volcanoes remotely through the use of electromagnetic waves." according to the department of defence.. The time is long gone when people should have woke up to what is really going on!! "It may sound like the crazed plan of a James Bond villain but scientists are working on a way to artificially cool the planet by reflecting sunlight away from the Earth. In a largely theoretical field known as geo-engineering, a team of British academics is about to announce a world-first with plans to field test an artificial volcano as a solution to global warming. The eventual plan is for a helium balloon the size of Wembley Stadium to be tethered 14 miles above the Earth by a giant hose, which will pump out tonnes of chemical particles into the stratosphere." Is Chemtrail Barium Contained in Secret STADIS-450 Fuel Additive? US Patent office provides little oversight to patent claims when Inventors are allowed to refer to dry powder jet engine emissions as "contrails". WTF? Key terms: Welsbach seeding, Global Warming, Powder Contrail Generator, JP-8, Fuel, Static Dissipator, Stratospheric Aerosol geoengineering, Stadis 450, dinonylnaphthalene sulfonic acid, barium salt, Aluminum, Chaff. NOTE: The Welsbach Seeding patent for Global Warming only calls for Aluminum or Thorium. 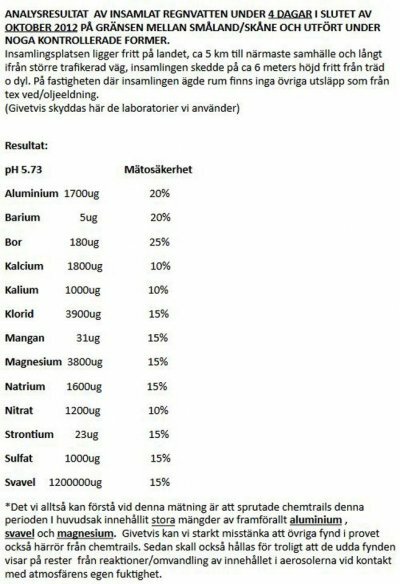 But the source of Barium has been isolated to secret compound (STADIS 450) found in Commercial and Air Force jet fuels. Geoengineering was correctly promoted as a drastic last resort to the worst effects of rapid Global Warming. It' suspicious and disturbing the the military-industrial-complex seems too anxious to spray the skies even before the Kyoto Protocol was given a chance to reduce carbon emissions. Considering the stated mission of "Owning the Waether in 2025", it's rational to wonder if the Geoengineering to save us from Global Warming is a pretext to weaponize the atmosphere, instead. So lets take another look at the 1991 Welsbach patent considered to be the most likely method of gengineering with "Chemtrails". Stratospheric Welsbach Seeding for Reduction of Global Warming. Let's look at the fine print. Adding tiny (nano-sized) reflective metallic particles to the fuel of jetliners is discussed. While this method appears to match what we often see in the skies, the inventor admits the net effect would be a net increase in global warming. Just the opposite of what the patent claims to fix. The summary of the invention is explicit that Aluminum oxide is the equivalent to what is called a "Welsbach material". If deployment of particles below the Stratosphere will increase global warming we can assume the atmosphere has been successfully warmed for over a decade. While passenger jets and Air Force tankers achieve high altitudes in the troposphere, neither aircraft is capable of true and adequate Stratospheric Aerosol geoengineering (SAG) at most pplanetary latitudes. The definition of "Welsbach material" is never made clear. Thorium oxide and Aluminum oxide are presented as two acceptable metal oxides that are equivalent to Welsbach Meterials. But is Barium oxide also a Welsbach material, or additive to the oxides of Aluminum or Thorium? Is Barium sprayed in addition to the Welsbach formula for a purpose having nothing to do with "Global Warming?" Could Aluminum and Barium oxides be sprayed from the same jet tanker but for different reasons? STADIS-450, is a "static dissipator" fuel additive that coould provide an answer. Although the ingredients are a "trade secret" study contracted by the EPA  and others implies these ingredients contain salts of barium and/or calcium. The EPA report also finds this barium salt is imported into the United States in high quantities of 1 million pounds or more per year. Broad application of Stadis 450 suggests the high Barium results in lab tests could be an incidental and INVISIBLE fall-out from commerical AND miltary jets. If so, the pollution of Barium may have nothing directly to do with Startospheric Aerosol Geoengineering. However the high volume of Barium reported in lab tests is more likely the result of an increase in overall air traffic by the addition of so many Military jets needed to spray the persistant contrails that we also refer to as "Chemtrails". It would be naive to assume the intended Geoengineering compound contains only Aluminum oxide, however. Aside from STADIS-450 the formula for the military version of JP-8 fuel is also classified, leaving the possibility that the jet fuel actually contains the aluminum oxide found to be associated with the high Barium analysis. Can the patenting process be corrupted to misrepresent the intent of an invention? In the case of the Powder contrail generator, the inventor was allowed the unethical privelage of corrupting the definition of "contrail" to include a dry powder formula. Now the Welsbach patent contains sufficient ambiguities as to raise serious questions about intent to deceive. Ordföranden av Serbiens ekorörelse Novi Sad, Nikola Aleksic, varnar den serbiska regeringen och militären för konsekvenser om de inte stoppar import av GMO och den avsiktliga massiva spridningen av giftiga kemikalier över serbiskt luftrum. Om hans krav inte tillmötesgås kommer att han att mana Serbiens folk ut på gatorna. ""Titta på våran himmel serbiska medborgare! Ni kan se det för er själva! Se spåren av gifter som dagligen sprids från omärkta plan. Från det ögonblick våran regering skrev på det så kallade partnerskapat för fred (14 december 2006), har den serbiska himmelen varit fullkomligt täckt av giftiga spår, som olagliga plan sprider dagligen som om vi vore insekter och inte folk." "Har du råd att vara en ynkrygg när du och dina barn konstant sprejas med gifter som ingen i vår regering berättar vad de innehåller?" De borde skjuta ned dessa omärkta plan och de brottslingar som utför detta massmord av våran befolkning"
"Någon sålde ut oss till dessa brottslingar. Någon sålde himmelen över Serbien till dessa brottslingar så att de skulle kunna förgifta oss..."
Så här avslutar han sitt tal: "Ni kan vara säkra på att jag, Nikola Aleksic, kommer att hålla mitt ord även om det så kostar mig livet"
In March, Hungary introduced a new regulation that states seeds must be checked for GMO before they are introduced to the market. 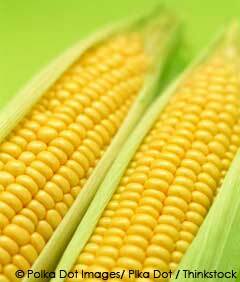 However, some GMO seeds made it to the farmers without their being aware of it. As a result, almost 1,000 acres of maize found to have been grown with genetically modified seeds have been destroyed throughout Hungary. The deputy state secretary of the Ministry of Rural Development Lajos Bognar said that the GMO maize has been ploughed under, and pollen has not spread from the maize. "Unlike several EU members, GMO seeds are banned in Hungary. The checks will continue despite the fact that seed traders are obliged to make sure that their products are GMO free, Bognar said." The United States, meanwhile, is beginning to see the consequences of widely planted GMOs. In the mid-'90s, Monsanto introduced seeds genetically engineered to withstand its Roundup brand of herbicide. Today, these "Roundup Ready" crops are planted all across the U.S. -- 94 percent of soybeans and more than 70 percent of corn and cotton contain the Roundup-resistant gene. But when the land is dosed with a single herbicide for years on end, the ecosystems adapt. Roundup-defying "superweeds" are getting out of control. And the problem is only accelerating, because the resistant weeds are driving out their non-resistant counterparts. "These weeds adapt faster and more vigorously than their weed cousins, choking fields and clogging irrigation ditches so badly water can't pass through." This invention relates to a method for the reduction of global warming resulting from the greenhouse effect, and in particular to a method which involves the seeding of the earth's stratosphere with Welsbach-like materials. Global warming has been a great concern of many environmental scientists. Scientists believe that the greenhouse effect is responsible for global warming. Greatly increased amounts of heat-trapping gases have been generated since the Industrial Revolution. These gases, such as CO 2 , CFC, and methane, accumulate in the atmosphere and allow sunlight to stream in freely but block heat from escaping (greenhouse effect). These gases are relatively transparent to sunshine but absorb strongly the long-wavelength infrared radiation released by the earth. Most current approaches to reduce global warming are to restrict the release of various greenhouse gases, such as CO 2 , CFC, and methane. These imply the need to establish new regulations and the need to monitor various gases and to enforce the regulations. A method is disclosed for reducing atmospheric warming due to the greenhouse effect resulting from a greenhouse gases layer. The method comprises the step of seeding the greenhouse gas layer with a quantity of tiny particles of materials characterized by wavelength-dependent emissivity or reflectivity, in that said materials have high emissivities in the visible and far infrared wavelength regions and low emissivity in the near infrared wavelength region. Such materials can include the class of materials known as Welsbach materials. The oxides of metal, e.g., aluminum oxide, are also suitable for the purpose. The greenhouse gases layer typically extends between about seven and thirteen kilometers above the earth's surface. The seeding of the stratosphere occurs within this layer. The particles suspended in the stratosphere as a result of the seeding provide a mechanism for converting the blackbody radiation emitted by the earth at near infrared wavelengths into radiation in the visible and far infrared wavelength so that this heat energy may be reradiated out into space, thereby reducing the global warming due to the greenhouse effect. A multi-agency SWAT-style armed raid was conducted this morning by helmet-wearing, gun-carrying enforcement agents from the LA County Sheriff's Office, the FDA, the Dept. of Agriculture and the CDC (Centers for Disease Control). Rawesome Foods, a private buying club offering wholesome, natural raw milk and raw cheese products (among other wholesome foods) is founded by James Stewart, a pioneer in bringing wholesome raw foods directly to consumers through a buying club. James was followed from his private residence by law enforcement, and when he entered his store, the raid was launched. Law enforcement demanded that all customers (members) of the store vacate the premises, then they demanded to know how much cash James had at the store. When James explained the amount of cash he had at the store -- which is used to purchase product for selling there -- agents demanded to know why he had such an amount of cash and where it came from. (NaturalNews) A new United Nations (UN) report blows a major hole in the modern myth that genetically-modified organisms (GMOs) are the answer to improving crop yields and ending world hunger. A UN Special Rapporteur explains that small-scale eco-farming reliant on natural growing methods works better than GMO and other pesticide-based agricultural systems at producing more and better food -- and if implemented on a wider scope, small-scale farming could double the world's food production capacity within ten years. "Today's scientific evidence demonstrates that agroecological methods outperform the use of chemical fertilizers in boosting food production where the hungry live -- especially in unfavorable environments," said Olivier De Schutter, the UN Special Rapporteur. "To date, agroecological projects have shown an average crop yield increase of 80 percent in 57 developing countries, with an average increase of 116 percent for all African projects. Recent projects conducted in 20 African countries demonstrated a doubling of crop yields over a period of three to ten years." Instead of relying on chemical pesticides and insecticides, eco-farming utilizes nature's own balance to thwart pests and improve yields. Certain combinations of trees, plants, animals, and insects, are used to maintain soil health and eliminate harmful pests. Beneficial insects like ladybugs, for instance, work very well in organic agriculture to protect crops from pests without the need for harsh chemical applications (http://blog.cascadianfarm.com/categ...). Unlike GMOs, eco-farming allows the People to freely grow and harvest their own food, and take advantage of what nature freely offers them in order to do so. Within the GMO paradigm, however, farmers are controlled by companies like Monsanto that sell them self-destructing "Frankenseeds." These seeds require heavy pesticide applications in order to grow, and represent an unsustainable system that has devastated the livelihoods of thousands of farmers while failing to deliver on its promises (http://www.naturalnews.com/GMO.html). De Schutter explained in his address that when the African country of Malawi replaced is "massive chemical fertilizer subsidy program" with agroecology, more than 1.3 million of the poorest people in the nation benefited, and corn yields increased from one ton per hectare (ton/ha) to up to three tons/ha. "Despite its impressive potential in realizing the right to food for all, agroecology is still insufficiently backed by ambitious public policies and consequently hardly goes beyond the experimental state," he added. SHOWERS have fallen after the first two flights of Queensland's cloud seeding trial. But scientists have yet to determine whether the precipitation occurred naturally or was caused by the seeding on Wednesday and yesterday. Paul Brady, managing director of MIPD, the company doing the seeding, said yesterday that the project would be a success. "We believe it works but the scientific level of proof is different to ours," Mr Brady said. In a world first, specialised radar equipment was being used to clarify the rainfall observations. "We should know within about a month whether the technology is producing results and have full reports in April," Mr Brady said. National Centre for Atmospheric Research scientist Roelof Bruintjes rated the flights over southeast Queensland a success but was coy about whether rain had fallen. "Cloud seeders always say, 'There's the rain', but I want to look at the data first," Dr Bruintjes said. Two different seeding processes are being tested – glaciogenic, in which silver iodide crystals are used, and hygroscopic, in which salt is applied. Both substances are fired into supercooled water in clouds. Ice accumulates, snowflakes form and then melt to become rain. Clouds about 1km in depth were sought for seeding and the next suitable conditions would probably occur on Australia Day. Sustainability Minister Andrew McNamara said $7.6 million will be spent on the research over four years. "Successful cloud seeding won't solve southeast Queensland's water crisis on its own but would be part of an overall package, including recycling, more efficient water use, desalination and new storage facilities," he said. "This project will focus on the Wivenhoe and Somerset dam catchments." Seeding would not end droughts but could boost inflows to dams. Cloud seeding elsewhere in the world could not automatically be transferred to Queensland because of regional climate, cloud characteristics and topographic differences. The southeast's combined dam levels were at 27.59 per cent yesterday and expected to start falling again soon as inflows slow. Current La Nina weather patterns will probably afford more opportunities to seed than the previous El Nino year. We have the power and the technology to save the world, says Mark Lynas – but first we must put aside our doubts about nuclear energy and geo-engineering. In May 2010, for only the second time in 3.7 billion years, a life form was created with no biological parent, out of a collection of inanimate chemicals. This transformation took place not in some primordial soup, still less the Garden of Eden, but in a Californian laboratory. And the Divine Creator was J Craig Venter, a world-renowned biologist, highly successful entrepreneur and one of the first sequencers of the human genome. The Book of Genesis is full of instances of Man being punished for his attempts to become like God – yet with the primacy of science, God's power is now increasingly being exercised by us. It is not just the dawn of Venter's "synthetic biology" that gives humanity the potential to design and create life from scratch. On a planetary scale, humans now assert unchallenged dominion over all living things. Our collective power already threatens or overwhelms most of the major forces of nature, from the water cycle to the circulation of major elements like nitrogen and carbon. We have levelled forests, ploughed up the great grasslands and transformed the continents to serve our demands. Our detritus gets everywhere, from the highest mountains to the deepest oceans. The productive capacity of a major part of the planet's terrestrial surface is now dedicated to satisfying our demands for food, fuel and fibre, whilst the oceans are trawled around the clock for the fishy fats and proteins our brains and bodies demand. Somewhere between a quarter and a third of the "net primary productivity" of the planet – everything produced by plants using the power of the Sun – is devoted to sustaining this one species. Human beings have, therefore, clearly been an unprecedented evolutionary success story. Yet there is a dark side to this momentous achievement. For the biosphere as a whole, the Age of Humans has been a catastrophe. Our domestication of the planet's surface to provide food and fuel has displaced all competing species to the margins. The Earth is now in the throes of its sixth mass extinction, the worst since the ecological calamity that wiped out the dinosaurs. No other species can control our numbers and return balance to the system. And most amazing of all is how blissfully unaware of this colossal transformation we remain. Even most Greens – ever hopeful that vanished wild nature can one day be restored – still recoil from the real truth about our role. Climate-change deniers are successful partly because they tap into a powerful cultural undercurrent that insists we are small and the planet is big, ergo nothing we do – not even in our collective billions – can have a planet-scale impact. "It's an act of egotism for humans to think we're a primary source of climate change," said Newt Gingrich last year. "Look at what happened recently with the Icelandic volcano. The natural systems are so much bigger than man-made systems." ""Foderförätning: den mest välkända orsaken till fång. Hästen/ponnyn kommer åt att äta stora mängder kraftfoder eller släpps på ett kraftigt grönbete, detta leder till störning i tarmfloran och efterföljande fång."" Using nanotechnology to 're-engineer' our environment? With federal funding?? 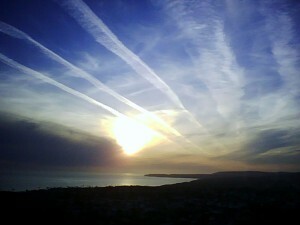 ""‘Geo-engineering’ is the ultimate in pursuit of high risk 'techno-fixes' to the world's big ecological problems. Its proponents want to use technology to attempt to ‘re-engineer’ the environment, for example by fertilising the ocean to produce huge algal blooms that supposedly will absorb carbon dioxide, or by polluting the upper atmosphere with nanoparticles in an attempt to deflect UV radiation and stop global warming. "" ""Earlier this week, former Vice President Al Gore spoke at New York City’s “Games For Change” Festival. He addressed his same old shtick: climate control and the environment, but this time added a new twist: adding that the stabilization of the earth’s population will help curb pollution. ""